The Aqsunqur or Blue Mosque, which lies north of the Citadel and close to the Bab Zuwayla, was built by one of al-Nasir Muhammad's Emirs, Shams ad-Din Aqsunqur, in 1346, and is one of Cairo's most notable mosques. While there is blue-Gray marble on the mosque's facade, it derives the name "Blue Mosque" from the interior walls, which are covered in isnik blue and turquoise tiles outlined with plant and flower designs. These ottoman tiles imported from Istanbul and Damascus were added when the structure was restored and modified in 1652 by Ibrahim Aga el-Mustahfizan, who used it for his own tomb. Together with the marble panels and painted ceiling, the interior is very ornate. The mosque is cruciform in design, with porticos originally covered by groined vaults instead of a wood ceiling. The arches are supported by square and octagonal pillars, which gives it an unusual appearance. 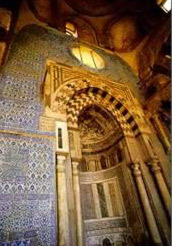 It contains a mihrab which is inlaid with polychrome marble and mosaic in soft plum, salmon, gray and green colors. The minbar is the oldest constructed of marble in Cairo, and is inlaid with precious stones. There are three tombs, one each dedicated to Sultan an-Nasir Mohammed, Ibrahim Aga, and Aqsunqur. The minaret offers a good view of the city.